Jerusalem, February 17, 2016…The 42nd annual COP Leadership Mission to Israel delegation spent their fourth day on the country’s borders with Syria and Lebanon for off-the-record briefings and later delved into Diaspora-Israel relations and the status of Israeli Arabs. While on the northern borders, the group learned about issues specific to the Syrian and Lebanese fronts, met with high-level IDF officers and heard from young men and women soldiers about their day-to-day roles and responsibilities defending the nation. Israeli Arab leaders who met with the group discussed the economic, educational, and social status of Israel’s Arab citizens – 20 percent of its population. Main areas for immediate action include upgrading the Arab business sector, encouraging employment, empowering municipalities, and increasing accessibility to higher education, particularly for women. The delegation also attended and participated in the concluding session of a day-long symposium, Stars, Stripes and Magen David: American Jewish Involvement in the Yeshuv and the State of Israel, at Haifa University in conjunction with the Ruderman Program for American Jewish Studies. 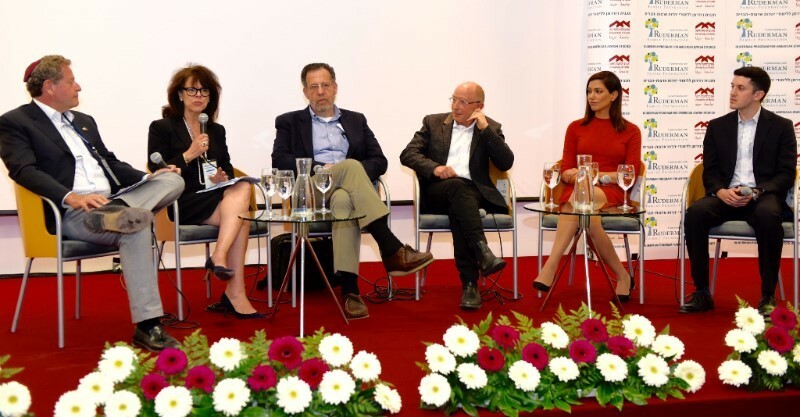 A panel discussion moderated by Haifa University’s incoming President Dr. Ron Robin considered the generational divide and level of support among American Jews. Panel members included Betty Ehrenberg, Executive Director, World Jewish Congress, North America; David Eisner, President, Ohr Tora Stone and President, 70 Faces Media; Len Saxe, Professor of Contemporary Jewish Studies; Cohen Center for Modern Jewish Studies and Steinhardt Social Research Institute at Brandeis University; Lital Shemesh, a graduate of the Ruderman Program; and Dan Smith, National Student Chair, Tamid Group and board member of the World Union of Jewish Students. The interactive dialogue on the future of American Jewry’s connection to Israel centered on the challenge of keeping the next generation of American Jews engaged and enthusiastic about Israel and their Jewish identity. Dr. Robin opened the discussion asking the panelists to consider the generational shift among American Jews and its possible impact on Jewish organizations. “American kids are still falling in love with Israel. I do worry about developing viable young leaders—we worry about how young people will sustain the passion of the generation before them,” said Betty Ehrenberg. Len Saxe said, “Millenials hardly join anything, yet this generation is more connected to Israel than any generation before.” He attributed this in large measure to the more than 300,000 young American Jews who have experienced Israel on Birthright trips. Lital Shemesh took a more pessimistic view of the younger generation of Diaspora Jewry, saying, “Young Jews simply don’t see that it is a miracle that after 2,000 years we have a state.” She lamented that on U.S. college campuses students are being told that Israel is bad, and that is all they’re learning. “It’s hard to see how many of them will have a connection to the Jewish state,” she said. The proven and effective voice of organized American Jewry for six decades, the Conference of Presidents of American Jewish Organizations advances the interests of the American Jewish Community, promotes broad-based support for Israel, and addresses critical concerns facing Israel and world Jewry. The delegation will be in Israel through Thursday, February 18 and will be meeting with high-level Israeli leaders, academics, diplomats and opinion makers across the political spectrum.